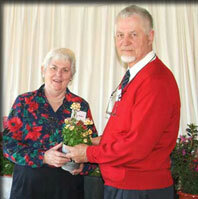 Aussie Winners® aims to meet Australian demand for outstanding new flowering ornamentals. It is the Australian arm of Proven Winners, an internationally renowned marketing cooperative of some of the world's best growers and propagators. Aussie Winners Pty Ltd has been set up by Edward and Mary Bunker to trial, introduce and market selected Proven Winner plants in Australia and New Zealand. They, in turn, have established a network of licensed propagators and growers throughout Australia and New Zealand so that these outstanding plants will be widely available. Aussie Winners plants will be sold in distinctive modern aluminium coloured plastic pots printed with the AW logo. Edward and Mary formerly owned Redlands Nursery in Queensland (now owned by their son, Tim). Edward, one of the small number of life members of the Nursery & Garden Industry of Australia (NGIA), says: “the Proven Winners idea has found appeal in many other parts of the world. Now Australian gardeners will have the chance to grow unique plants that have benefited from breeding research and development on an international scale”. Aussie Winners also aims to enhance Australia’s contribution to the development of new plants for the world market by introducing the work of Australian breeders to the world wide network.